Pop! Goes the Cling™ Shade! Pop open, reusable shade easily clings to window. Whether you are on a road trip or just a jaunt across town, these BRICA Cling™ SunSafety™ Shades give you a cool, comfortable ride in seconds. 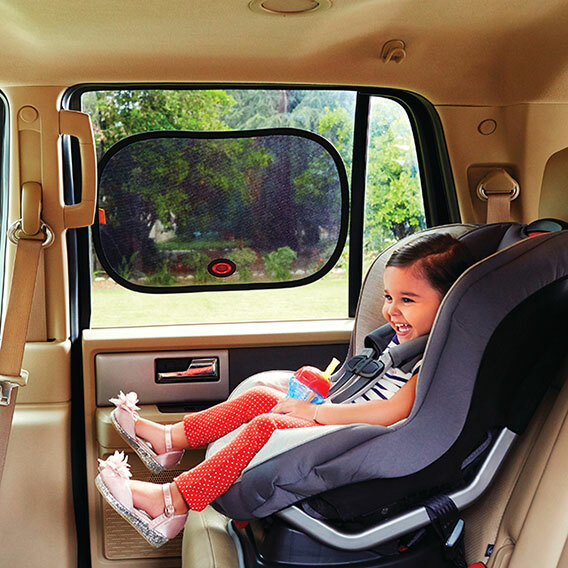 The durable, Soft-Twist™ safety frame folds easily for storage and when you are ready for some shade, just pop it open and the dual-layer mesh material clings to your car window, blocking over 90% of harmful UV rays...without blocking your view. Is the car too hot for your child? Let the patented White Hot® system let you know by turning white when the car is too hot. The lightweight design makes it simple to install, remove and reuse and the two extra-large shades give you flexible options so you can be sure you've got things covered.